Call For Dental Implant Costs! I have many patients who wear bridges, removable dentures and partial dentures because they don’t feel they can afford implants. I honestly believe that if my patients would analyze the long term cost and consider the convenience and durability of implants, they would choose implants over other 'luxuiries' they might have spent money on. Being able to properly chew food and have it enter the GI tract in the proper consistency is very important to our health and the long term viability of our bodies. As detailed in the paragraph at the top of this page, if you are a good candidate for an implant at our office, and depending on whether you present to our office with a tooth already missing or not, the total cost from start to finish to replace each tooth is between $3,000 and $4,000 total per tooth. 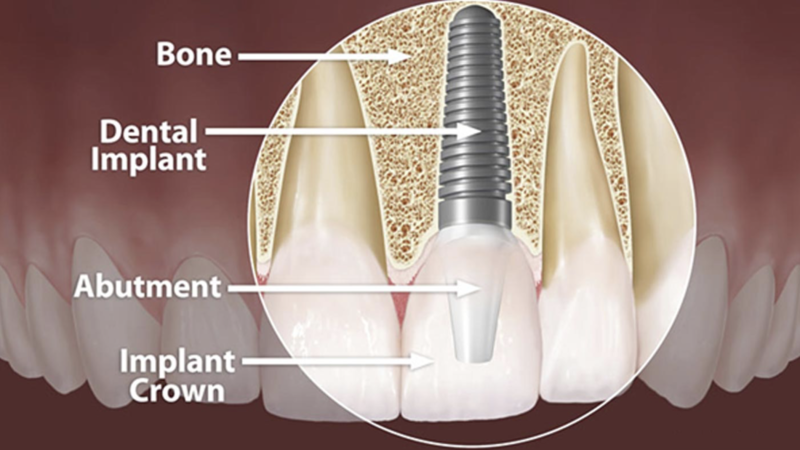 In certain special cases, your specific condition will require that you are referred to a specialist for the implant placement instead of having the procedure done at our office. This will be revealed by a thorough examination, including x-rays and a CT scan. The extraction and bone grafting can still be done here, and the abutment and crown also can still be done here, at the costs mentioned above. The only difference will be the cost of the implant placement, and any additional procedures which might be needed (extensive bone reconstruction, sinus lift, etc.). These costs will be quoted to you by the specialist, either one of the specialists whom we refer to, or one of your own choosing.